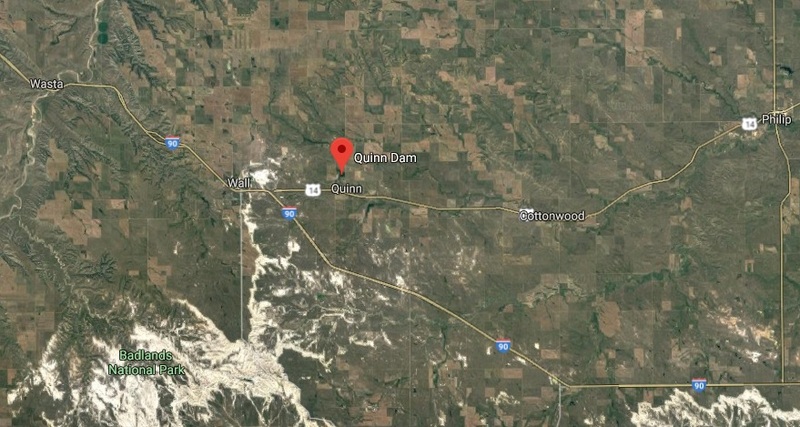 On Tuesday morning, March 26, 2019, residents of the small Pennington County town of Quinn have been warned that a nearby dam may fail due to a growing hole. “Quinn Dam appears to be failing. Large amounts of water may be uncontrollably released soon. Anyone downstream should seek higher ground,” says a message from Rapid City-Pennington County Emergency Management. South Dakota Department of Transportation announced at 10:20 a.m. that U.S. Highway 14 in that area is closed due to flooding between Interstate 90 and Wall and between S.D. Highway 73 and Philip. Around the same time, National Weather Service in Rapid City issued a flash flood warning for that area, where three counties converge: east central Pennington County, southwestern Haakon County and northwestern Jackson County. Locations along Cottonwood Creek will be affected, including Quinn and Cottonwood, a tiny community straight east of Quinn along Highway 14. A hole in the dam “seems to be growing,” said Alex White, deputy director of Rapid City-Pennington County Emergency Management. She said it’s unclear whether the dam will fail, but out of precaution, her office alerted 32 homes and businesses in Quinn via phone calls, emails and/or texts. She said deputies are not knocking on doors or making people evacuate. While water has been released from the dam since a recent blizzard caused massive flooding, White said, today’s warm temperatures will melt more snow, creating more water for the dam. Following the “bomb cyclone” earlier this month that deluged the area with snow and rain, heavy spring flooding has been wreaking havoc across the Midwest, including much of South Dakota. Many residents of the Pine Ridge Indian Reservation have been stranded for nearly a week, as high water has made many roads impassable, prompting South Dakota Gov. Kristi Noem to send 13 National Guard units to the reservation to help distribute drinking water. Ice jams caused flooding along vast stretches of the Cheyenne and White rivers across central and western South Dakota. On the eastern side of the state, communities near waterways like the Big Sioux River and James River prepared sandbags, and some people moved to higher ground. Farther south, a swollen Missouri River crept toward people’s homes and yards. Officials across South Dakota, officials have been urging people to take flood preparation seriously. The state also activated its Emergency Operations Center in Pierre, with state and federal agencies in close communication. In Quinn, White said officials are at the dam to determine if anything can be done to prevent a failure.